It’s no secret that Australians love to eat out and a restaurant can be a smart business venture. However, every type of business faces risks and your restaurant and café is no exception, no matter how smoothly it runs. As experts in restaurant insurance, we’re familiar the unique risks that you face as a restaurant or café owner. With that in mind, we’re here to explore some of these risks so you’re better equipped to protect your business (with a little help from the right insurance). When you run a restaurant or café with people coming and going, it’s understandable that you’re at a higher risk of slips and falls occurring on the premises. This doesn’t just apply to customers – your staff are at risk too! Make sure that you maintain your premises well so any hazards are quickly identified to avoid falls and have an appropriate risk management strategy in place. This includes having public liability insurance and workers compensation insurance to protect your business financially. When you work with food on a daily basis, there are always risks involved with potential contamination which could potentially lead to illness. Make sure you follow food safety guidelines and train your staff well so they don’t become complacent. Of course, even if you have stringent hygiene procedures in place, there is still a risk that food which has been previously contaminated makes it through so have a plan in place for dealing with these types of incidents. Remember to speak to your insurance broker to ensure you have cover if a food contamination incident results in a claim. No matter how meticulous you are with the running of your restaurant, there may be occasions where something completely out of your control occurs, such as a fire or storm damage. Incidents such as these could have a serious impact on your ability to continue business as normal and the best safeguard is to ensure you have insurance in place which will cover the costs associated with fire and natural disasters. It’s a reality in many businesses that theft or vandalism can occur, and restaurants often find themselves on the receiving end of these incidents. Not only is this frustrating, it can also be expensive to carry out repairs and replacements and it can lead to your business being out of action for a period of time. To cover yourself, consider insurance policies for theft, glass damage and business interruption. At GSK Insurance Brokers, we understand the specific set of risks faced by café and restaurant owners and our brokers can help you develop a tailored insurance solution for your business. We’ll assess the unique risk profile of your business and find you comprehensive cover with competitive premiums. With our help, you can have financial peace of mind. 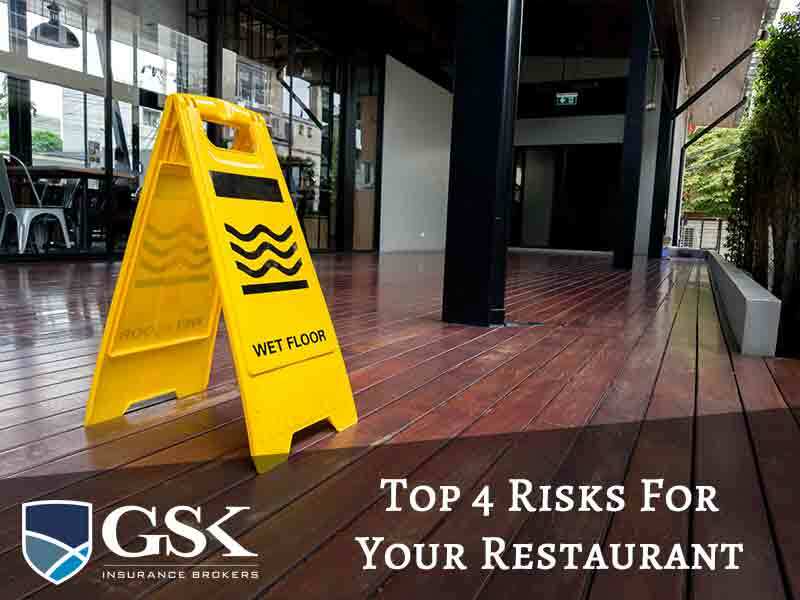 For restaurant and café insurance, speak to the experienced team at GSK Insurance Brokers today on (08) 9478 1933.